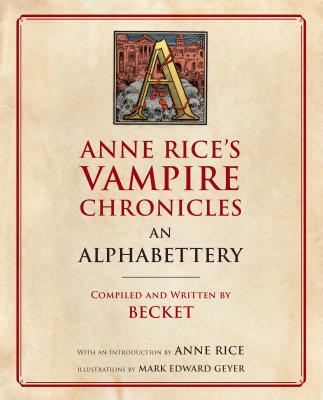 An Alphabettery of Anne Rice's Vampire Chronicles gathers together, from all fifteen of the books in the series, the facts, details, story lines, genealogies of her characters, vampiric subjects, geographical influences, and cultural and individual histories, all of which Rice painstakingly researched and invented during her 40-year career--to date--through which she has enchanted and transported us. Here are concise, detailed biographies of every character, no matter how central or minor to the cosmology. BECKET has a bachelor's degree in music composition and master's degrees in systematic theology and industrial organizational psychology. He was a diocesan seminarian for three years and a Benedictine monk for five and from 2005 to 2017 was the personal assistant to Anne Rice. He is the author of eleven books, including three books of poetry. He lives with his wife in Steubenville, Ohio. MARK EDWARD GEYER received a B.A. in Studio Art from Florida State University. He has illustrated Stephen King's Rose Madder and The Green Mile, the middle-grade series Inquisitor's Apprentice, and other books. He teaches at Rocky Mountain College of Art and Design, and lives with his wife.